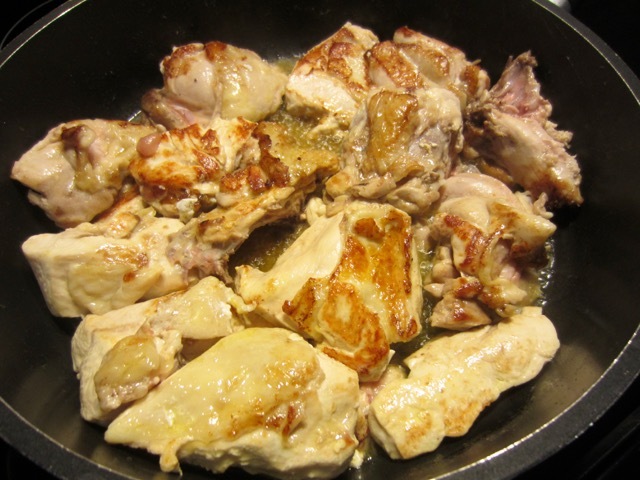 Heat the clarified butter in a large deep skillet. 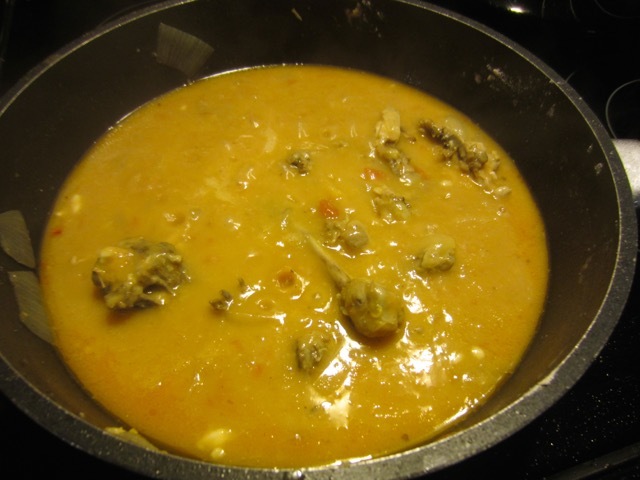 Add the chicken pieces and chopped carcass and brown them lightly over medium heat. Add the onions, tomatoes, bouquet garni. Season with salt and cook for a few minutes. Add the wine, cover the pan with a lid and simmer gently for 15 minutes. Add the carrots in the last 10 minutes of cooking. 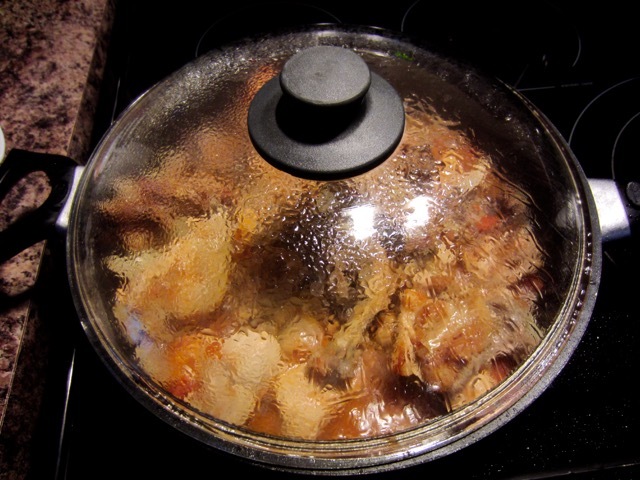 Remove the chicken pieces and carrots from the pan and set side covered with a damp dish towel. Slice the chicken into bite size pieces. and stir continuously until blended. Add the chicken stock, bring to the boil, stirring from time to time, then cook for 20 minutes, skimming the surface from time to time. Heat the extra butter in a skillet and saute the pork cubes until golden, then remove and set aside. 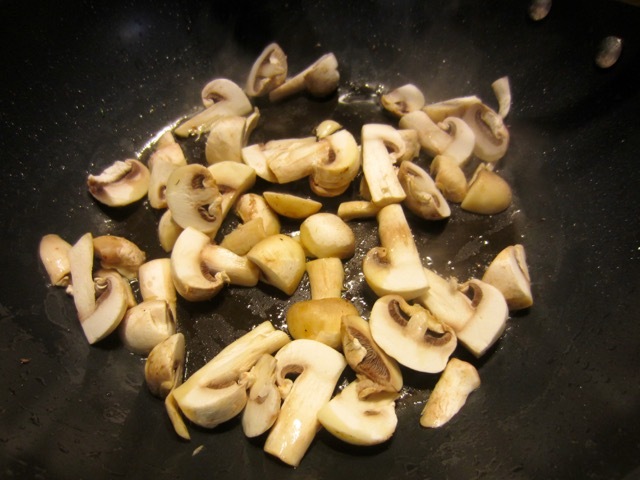 Add the mushrooms to the same skillet and saute 2-3 minutes then set aside with the pork. Strain the chicken sauce over the chicken and carrot pieces. 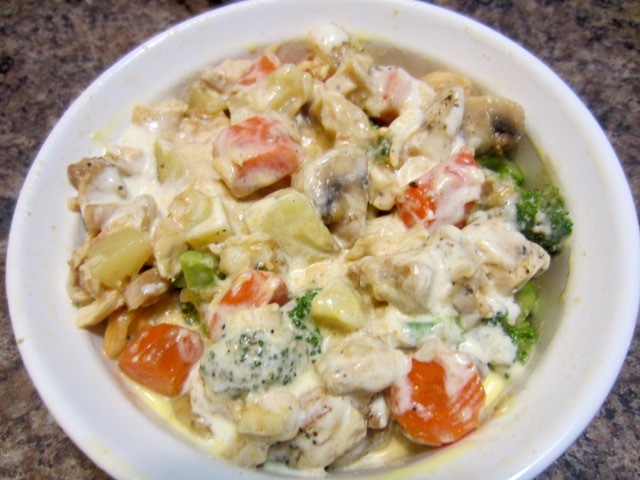 Add the pork cubes, mushrooms, and broccoli and mix delicately with a wooden spoon. Season with salt and pepper to taste. 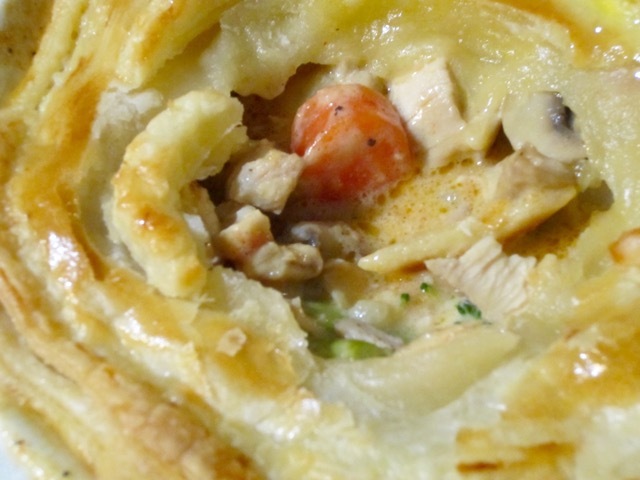 Divide the chicken, sauce and veggies between the 4 pie dishes. Leave at room temperature until cold then chill for 1 hour. 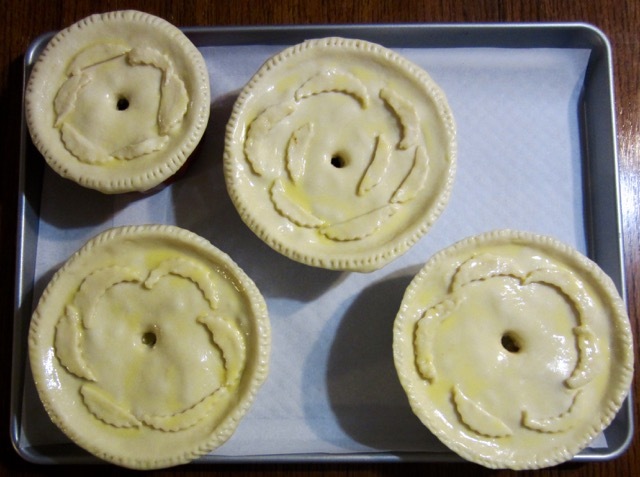 Assembling the pies: on a floured surface, roll one quarter of the dough into a 6½ inch (16cm) circle, 1/8-inch (3mm) thick. Brush the top edge of one pie dish with egg wash and cover with the dough. Repeat with the other three pies and chill the pies for 20 minutes. Use a sharp knife to cut a small hole in the centre or each pie, place pie dishes on a baking sheet and then bake for 1 hour. 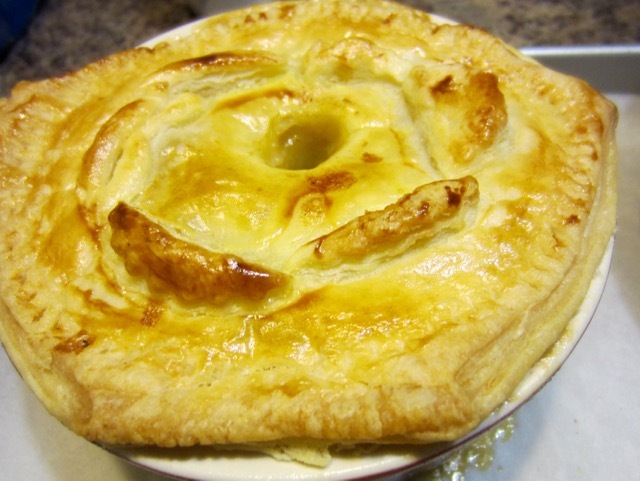 Put the pies on individual plates and serve piping hot, with salad or green vegetable. Four 6½ x 2½ inch (16 x 6.35cm; 24oz, 708ml) round pie dishes. Preheat the oven to 400ºF (200ºC) ten minutes before using. Line a large baking sheet with parchment or aluminium foil and set aside. 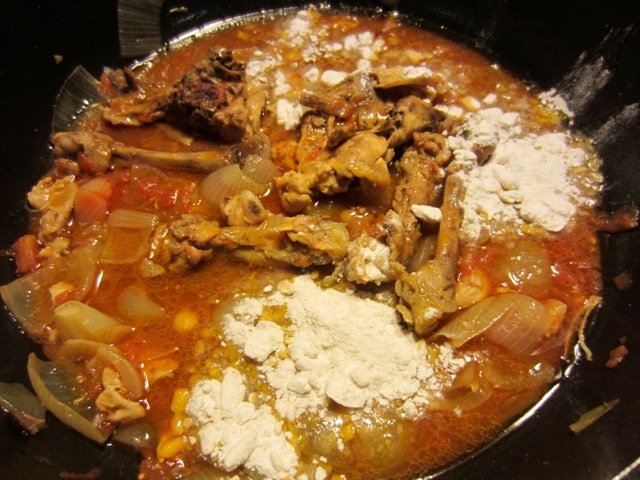 Sprinkle the flour onto a large skillet and toast over medium-low heat for 5 minutes. Set aside. Blanch the pork cubes in boiling salted water for 5 minutes, then drain, refresh in cold water, drain and pat dry. Set aside. Blanch the broccoli in boiling salted water for 30 seconds, then drain, refresh in cold water and drain. Set aside. 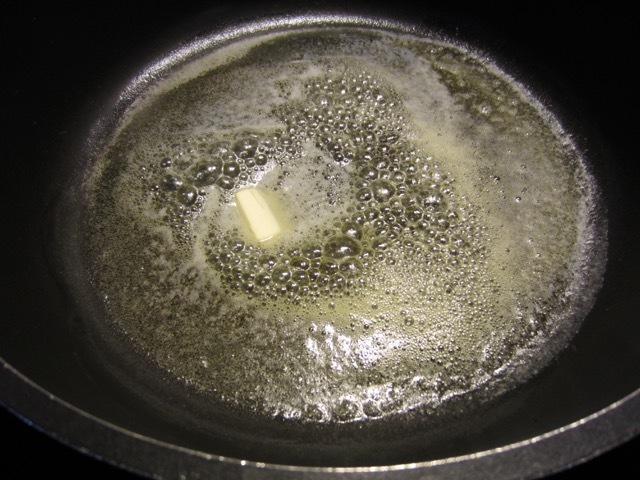 Heat the clarified butter in a large deep skillet. Add the chicken pieces and chopped carcass and brown them lightly over medium heat (If it renders too much fat, drain some). Add the onions, tomatoes and bouquet garni. Season with salt and cook for a few minutes. Add the wine, cover the pan with a lid and simmer gently for 15 minutes. Add the carrots in the last 5 minutes of cooking. 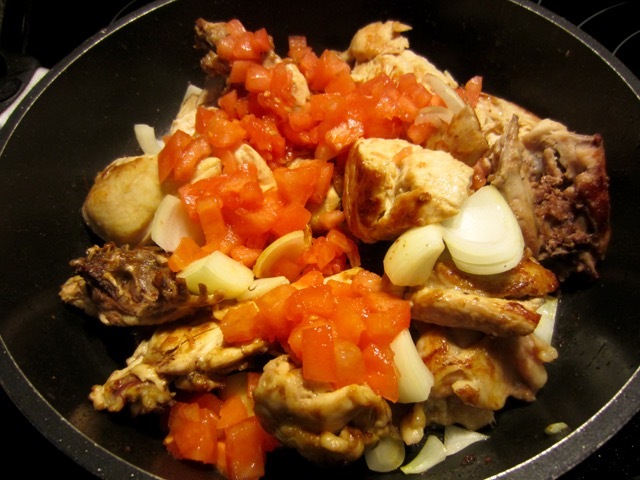 Remove the chicken pieces and carrots from the pan. Cut the chicken into cubes then set side, with the carrots, covered with a damp dish towel. 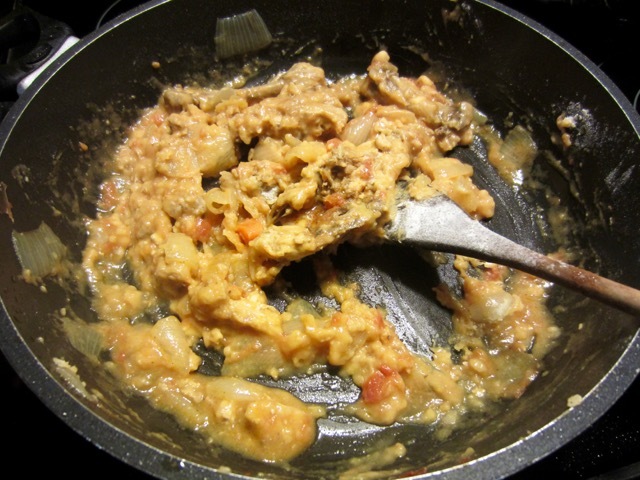 Sprinkle the toasted flour into the skillet and stir continuously until blended. Add the chicken stock, bring to the boil, stirring from time to time, then cook for 20 minutes, skimming the surface from time to time. 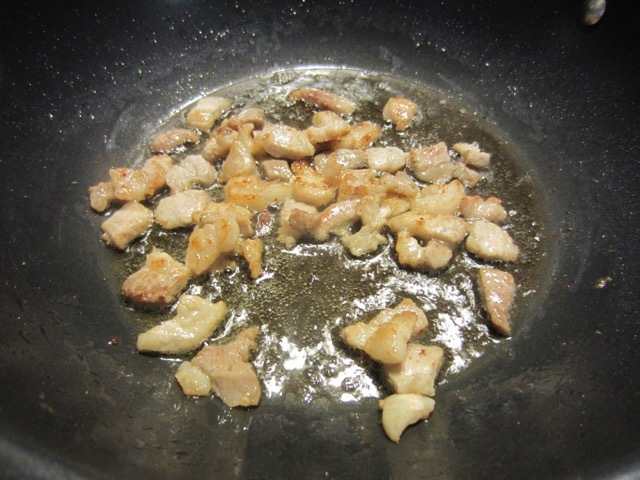 Heat the extra butter in a skillet and saute the pork cubes until golden, then remove and set aside. Add the mushrooms to the same skillet and saute 2-3 minutes then set aside with the pork. 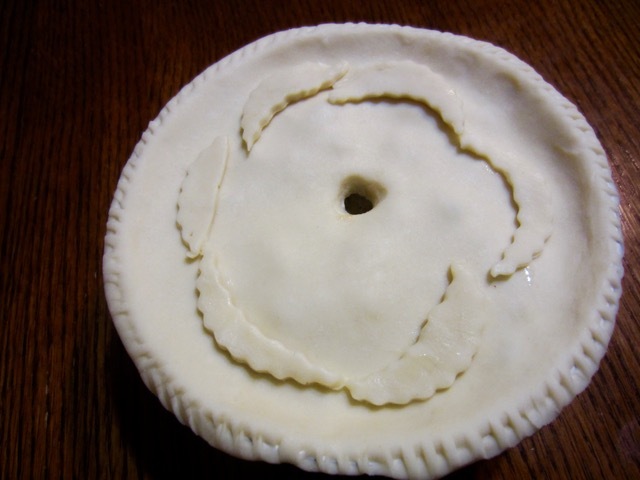 Assembling the pies: on a floured surface, roll one quarter of the dough into a 6½ inch (16cm) circle, 1/8-inch (3mm) thick. Brush the op edge of one pie dish with egg wash and cover with the dough. Repeat with the other three pies and chill the pies for 20 minutes. Cut off excess dough overhanging the dishes with scissors and brush the top with egg wash. Roll out the dough trimmings into 1.5mm (5/8-inch) thickness and cut out thin crescents with 1¼ inch (4.5cm) fluted pastry cutter. Arrange 7 crescents around the edge of each pie and brush them with egg wash. Use a sharp knife to cut a small hole in the centre or each pie, place pie dishes on a baking sheet and then bake for 30-45 minutes or until the pastry if golden and puffed up. Put the pies on individual plates and serve piping hot, with salad or green vegetable. The pastry should be rolled a thin as possible, left to rest in the fridge for 20 minutes before covering the baking dish. It should be chilled 15-20 minutes before baking for best result. Baked at 425ºF for 40 minutes. It gets bubbling hot at 40 minutes, but pastry wasn’t cooked through in the middle. Baked at 400ºF (200ºC) for 30 minutes, then reduced to 350ºF (180ºC) for twenty minutes to ensure puff pastry is fully cooked. It gets bubbling hot at 45 minutes and pastry is cooked through. Prev What is a Punnet? 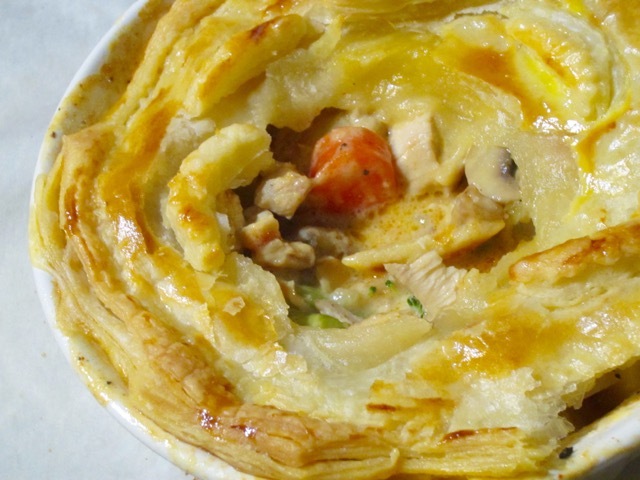 This is such a different recipe for a chicken pot pie and sounds terrific. Tastes terrific too. Have a great week, ahead! I have been making every week. 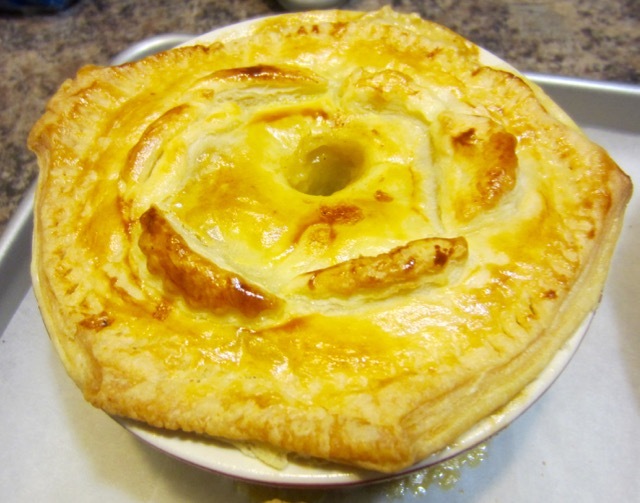 I really enjoy pot pies! I love the look of these pies Liz.